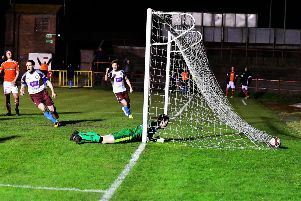 South Shields fell just short in the League Cup last night as they were beaten 3-2 by Coalville Town in the semi-final. Shields – who fielded four academy prospects from the start at Mariners Park – had some good moments against their Evo-Stik Premier Division opponents. However, after falling 3-1 behind they left themselves too much to do in the closing stages and just failed to force a penalty shoot-out. They got off to the worst possible start, with Daniel Creaney giving the visitors the lead inside the first two minutes when the ball broke to him in the box and he made no mistake. Dean Freeman headed over from a corner soon after as Coalville looked to press ahead with their advantage. The Mariners fought back well after that, and Aksel Juul and Dan Lowther had sighters of goal as they gained a foothold. Shields got their reward in the 19th minute as a terrific through ball from Ethan Biwer found Michael Richardson, who rounded the keeper and slotted home. Coalville responded well, and Cleveland Taylor struck the post with an effort from the right before Paul Woolston was forced into an impressive double save from Alex Howes and Creaney. Jon Shaw had to clear a further shot off the line and Woolston made two more good saves as the visitors kept up the pressure. They went back in front four minutes into the second half when Nathan Watson slotted in from the inside left of the box. Richardson was one of Shields’ biggest threats, and he had a chance to equalise again, but his low effort was kept out by goalkeeper Elliott Taylor. Coalville had some chances to go further ahead, the best of which saw a Danny Jenno header cleared off the line by Alex Nicholson. They then struck what looked set to be a killer blow when Watson fired in his second via the crossbar. Woolston made a good double save to keep the deficit at two before Shields rallied in an attempt to launch a late comeback. They pulled one goal back when a Richardson free-kick from 25 yards took a huge deflection before nestling in the top corner. There were opportunities for Shields to level, and they looked like they had done just that with five minutes left when a defender headed into his own net, but the flag controversially went up for offside. A further golden opportunity fell to substitute Graeme Armstrong, but he fired over from close range. Shields return to league action tomorrow when they host Colwyn Bay in a 3pm kick-off. SOUTH SHIELDS: Woolston, Nicholson, Biwer, Shaw (c), Storey, Ross, Richardson, Lowther (Kavanagh 74), Sullivan, Guy (Finnigan 66), Juul (Armstrong 78). Subs not used: Connell, Patterson.